Corine de Farme Baby Talcum Powder - 200 g | Multicolour | It absorbs excess moisture and helps envelopes the skin with a protection veil which fighting redness . 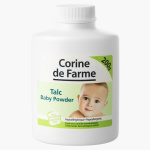 Apply this baby powder to your little one's body after a shower to protect delicate skin from rashes. This baby powder absorbs excess moisture and helps envelope the skin with a protective veil to fight redness. Feature 2 : protects delicate baby skin from rashes. Feature 1 : It absorbs excess moisture and helps envelopes the skin with a protection veil which fighting redness .